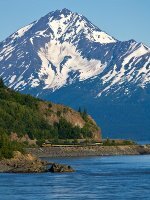 Description: This is the late afternoon train from Seward to Anchorage. Description: The train has just arrived from Anchorage on a very foggy seaside morning. Most of these passengers are headed for boats that will take them out on Resurrection Bay and the Gulf of Alaska to see whales and glaciers caving. The afternoon turned sunny out on the boats before the late afternoon departure back to Anchorage. 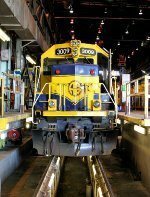 Description: ARR GP40-2 #3009 with the train from Seward to Anchorage in the afternoon of July 20, 1995. Location is somewhere between Portage and Seward. 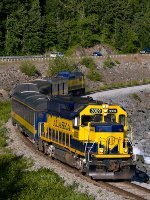 Description: ARR 3009 leads the daily (summertime, anyway) north along the shores of the Turnagain Arm and the Seward Highway. Description: The daily Glacier Discovery winds its way north between the Seward Highway and the shore of the Turnagain Arm. Description: The Glacier Discovery works its way north back toward Anchorage on a pleasant summer evening through some spectacular scenery. 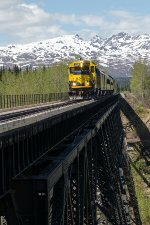 I was initially at the Ted Stevens Anchorage International Airport to glass some cargo planes, but a bicycle race where I was shooting "forced" me to go out and chase trains instead...glad it did! Description: A pre-season run of the Glacier Discovery is seen running south through Bird Point. Description: ARR 3009 proceeding south on the mainline from its storage siding to the Talkeetna Depot. I need to hurry up as Im riding the train. Mt. Foraker is in the background. Description: ARR 3009 a picture perfect pose on the curve. This would be a lovely spot in fall. Description: ARR 3009 stopped at MP 238. IMHO this is the ultimate McKinley shot. Yes, this had been a good day.